Our felted cardinal bird has been a favorite among the team since our craft assistant Jessica created him a couple days ago. She is so clever! There is something about the soft wool roving and the felt features that make him simply irresistible. We are all in love with this little guy and hope you enjoy crafting him as much as we did! To see how we made him, scroll down for the photo tutorial. 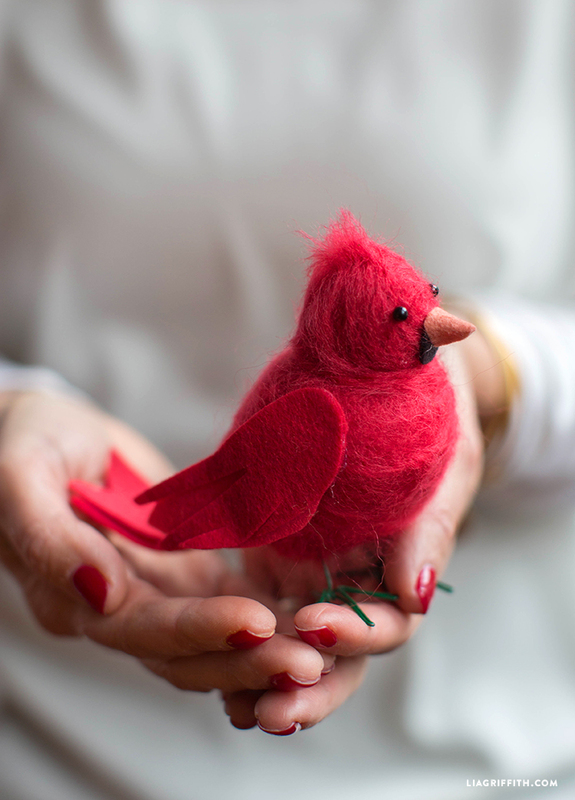 A vibrant red cardinal is the ideal felt bird to make for the holiday season—not just because of its color but because it symbolizes hope, love, pride, focus, and energy. For the body of our felted cardinal bird, we used a 3″ egg-shaped foam ball. We covered it in wool felt roving, and then we attached it to the foam ball using a roving needle. The head of our felted cardinal bird is made by creating a ball out of the wool roving felt and the wings are made from a little bit of felt fabric in two shades of red. His feet are made with floral wire. We assembled everything using a low-temperature glue gun. To make this cute little fella for the holidays, you can follow our DIY tutorial below. 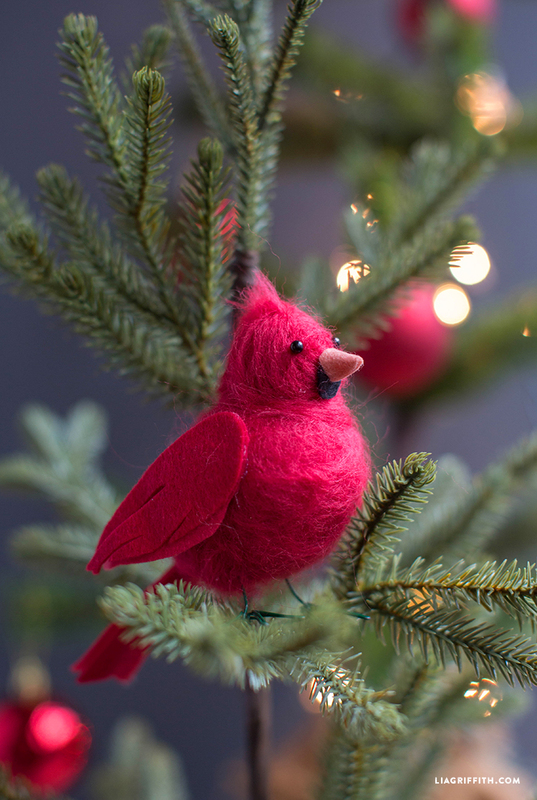 Make an entire flock of felted cardinal birds for your tree or just make the one for your holiday mantel, give him as a gift, or keep him all to yourself! 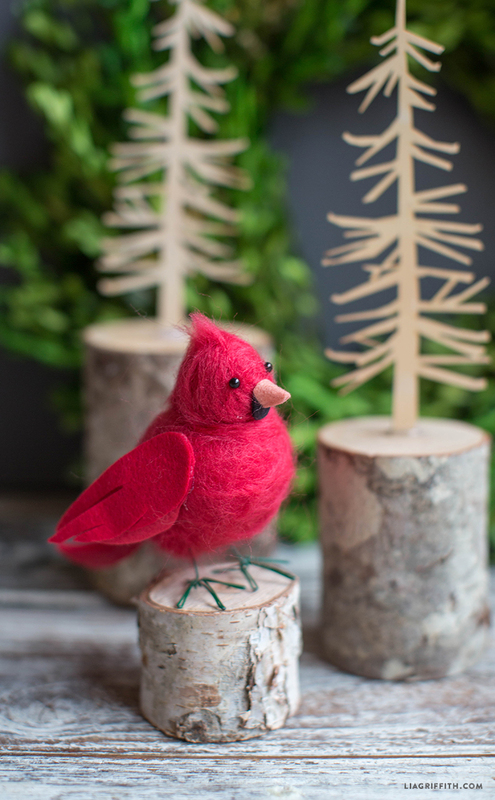 Either way, making this felted cardinal bird is sure to bring you plenty of joy this holiday! For more holiday DIY inspiration, take a look at our Christmas projects over here. Or you can follow us on Facebook, Pinterest, Instagram, or YouTube to see what we are sharing next. I was wondering when you poke the styrofoam with the wool does it ruin the foam? Love all of your things! So very creative! For the eyes we used sewing pins with black heads that are poked into the felt. You can also use small beads, which you can find at Michaels or any other local craft store. Every time I look at your adorable cardinal I love him/her even more. Great interpretation of cardinal. Love it’s fuzzy top. You guys all rock. Looking forward to needle felting video. Hopefully we can get that video up by the new year! I sure would love to make this cardinal for a very long time life friend. We’ve known each other since freshman year of high school. She practically lived with us all thru high school. When we graduated my Dad got her a job at bank where he worked. She stayed with banking til she finally said adios to working at 65. She is like sister to me. Wish I could see her since we’re both 75 now and who knows what life holds. When we had our 50th. high school reunion (April 2008) I got a loan so I could go to first reunion in all those years. None of yearbook or reunion people knew where I was so they’d ask my friend. We had such a good time, went shopping til we dropped, Tucson had changed and grown so much since I’d been there in`1997 after my Mom died. . I took Greyhound bus to reunion and back (trying to save money). Boy was that an experience, lol, not one I care to repeat, EVER. Anyway my friend loves cardinals so maybe after shoulder heals I can try to make one (in some way or other) for her. Wanted to tell you all, got my Cricut today, can you believe that? Did I really win it? Still can’t believe. Didn’t get to play with it at all today as we had to take couple things back we bought yesterday to exchange, people at store were so nice considering what they must have had to put up with for few days now. I made sure I told them how much I appreciated their courtesy, luckily had receipt for both items . Before we left for Grand Junction was getting out holiday decorations I had gotten at $tree. Tonight I bought our real tree, small and not perfect but it’s real for first time in years. Had made up my mind was going to have real tree this year. Bought it from FFA group in small town just to east of us where our daughter and family live. Only two real tree lots in whole area, so many people use faux trees now or go cut their own. We used to cut our own in MT, wasn’t very far to get there. Was lucky as found gifts for grandsons in KY. Hope they like what we got them. Only way we get to see them is on Facebook but that’s better than nothing. At least their Mom sends us photos of them from school also. Well younger one, older one is sophomore at college in Lexington, KY He is on full ride scholarship to be chemical engineer. Last year he was on Dean’s list whole year. Such a good kid and so sweet and loving to this set of grandparents. Sorry had to brag on him. They’ll both be going to San Diego for Christmas to be with my oldest son, their Dad. Hope You all had wonderful Thanksgiving and weekend. Again thanks so much for my very precious Cricut Explore. Awesome. So glad to hear you successfully got your Cricut!! I hope you had a lovely Thanksgiving as well 🙂 Send us some photos of your Cricut creations when you make them, we would love to see! 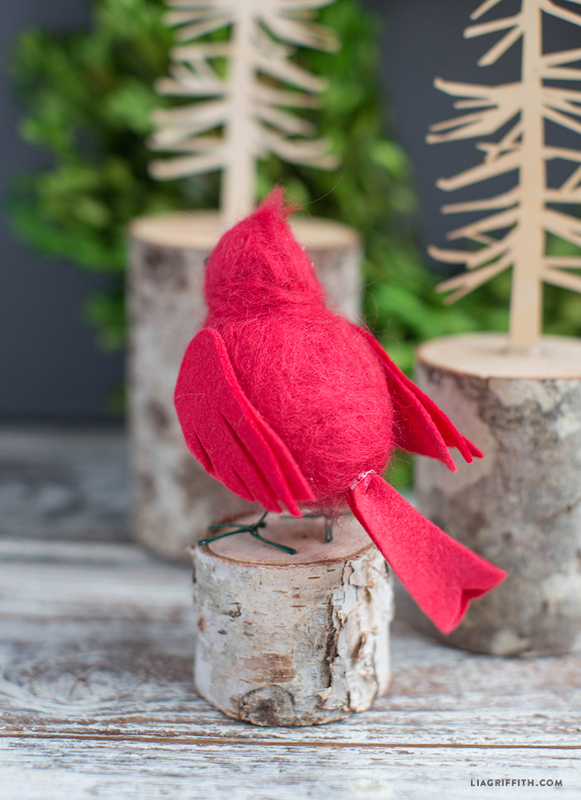 Two questions – do you have a pattern for the little paper and wood trees pictured with the lovely little Cardinal? Will you be sharing with us the new projects that are bundled with the give away Circut? Hi Pam. We will be sharing a similar wood tree pattern in the next week. The designs we did for the Michaels bundle of the Cricut are exclusive to them, though we may have similar items coming up or that we have already posted. I was especially interested in the deer head. Hopefully something of that type. Thank you for your quick reply. Oh too cute. Not really sure about how to needle felt. is there a video 101 on needle felting ? Finally broke down & joined your membership subscription – so excited. We are planning to do a needle felting video soon. Check on YouTube though as there are some good ones there. It does take a special needle and you can find that at the yarn store along with the roving felt.